Whew! It’s been a really hectic couple of weeks traveling for work and leisure. Tom turned 30 and we had a weekend-long celebration in Las Vegas. For the record, rx Burger Bar might just be my favorite place on earth. They let you add jalapeno bacon to your burger. Have you ever even heard of jalapeÃ±o bacon? It was astounding. Wonderful. Magnificent. Almost brought tears to my eyes. I’m already planning my trip back just so I can have another taste of that jalapeÃ±o bacon. But, moving on… Since I’ve had zero time to cook, I had a really bizarre assortment of ingredients in the fridge. Turkey kielbasa, one egg, savoy cabbage, some onions, peanut butter, piquillo peppers, condiments galore and way too much beer. But don’t worry – I didn’t just combine everything for this dish. 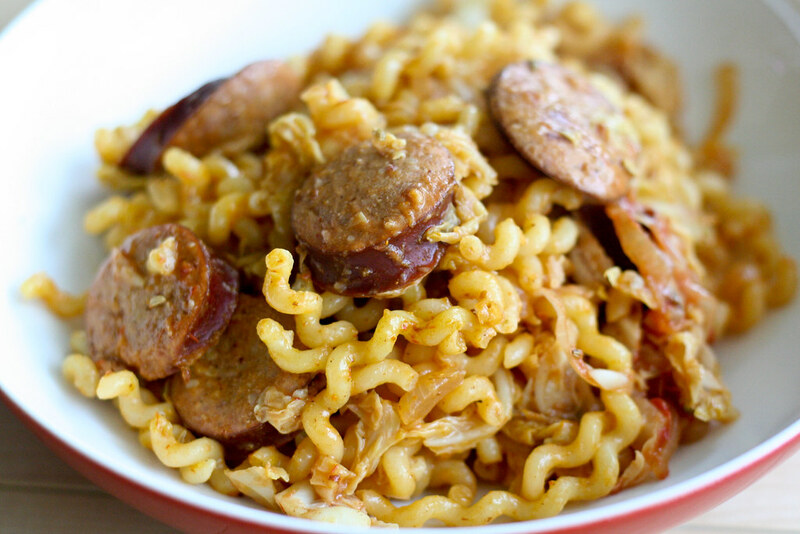 Instead, I translated German Currywurst into a noodle dish. I sauteed some onions, turkey kielbasa and thinly sliced cabbage, then made a simple sauce with some white wine, deli mustard, tomato paste and hot curry powder. The result was a really comforting bowl of noodles. Reminiscent of German street food, but not so much that it was weird. One of those pantry meals that ends up being a total winner and something I’ll actually make again. At least, my husband hopes I will. Set a large pot of water to boil. Once it comes to a rolling boil, salt it thoroughly and cook your noodles according to package directions, or until almost al dente. Reserve one cup of the cooking water and drain the noodles. While the noodles are cooking, set a large skillet or wok pan over medium-high heat. Once it’s hot, heat the olive oil. Add the onions and cook for about 8 minutes, or until soft and translucent. Add the kielbasa and brown on all side – about 7 minutes. Remove the kielbasa and onions to a bowl. Add the white wine and deglaze the pan, then add the cabbage and cook for 5 – 8 minutes, or until it wilts and browns a bit. Add the onions and kielbasa back to the skillet, along with the mustard, tomato paste, fennel seeds, curry powder or cooking water. Mix until everything is evenly combined and a sauce forms. Toss with the noodles and cook for a minute, letting the sauce become absorbed by the noodles. Your Currywurst recipe was a hit at my house this weekend. I enjoyed the soft taste of the noodles (that were kicked up with the hot curry powder). It was easy to pull together and complimented a beautiful evening in New Mexico. I have been “going thru the motion” of cooking for many years until I started reading about your creative and artistic culinary delights. I have restocked my spice rack, allowed myself the time I need to follow your directions, and actually enjoy myself! Keep up the good work Mel. Those of us raised on more traditional cookbooks are inspired. Pat from Albuquerque. Mel – I really admire your ability to pull a great meal together from a practically empty fridge…..glad you left out the peanut butter. The only thing that could make this any better is to add spatzel! Looks great- I’m certainly going to try this comfort inducing recipe!